3 Freecharge icon = IPL Vip Ticket. 3 Trophy icon = IPL Stand Ticket. 1 Ball icon + 2 any symbol = Rs. 50 cashback. 1 Bat icon + 2 any symbol = Rs. 25 cashback. Stumps icon + 2 any symbol = Rs. 10 cashback. 1 Helmat icon + 2 any symbol = Rs. 5 cashback. 1 Pad icon + 2 any symbol = Rs. 3 cashback. 1 Trophy icon + 2 any symbol = Rs. 2 cashback. 1 Game Conroller icon + any 2 other icon = Rs. 20 cashback. Wicket icon + 2 any symbol = No Prize. Freecharge logo + 2 any symbol = No Prize. 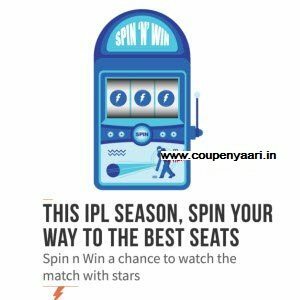 How to do Freecharge Spin n Win IPL Tickets and Cashback? Download or open Freecharge Android App (Offer valid only on Android app). Recharge with Rs. 50 or more. On very successful Recharge (i.e., Recharge of Rs. 50/-), a single token will be rewarded in the form of Token. After successful recharge click on left menu > select Rewards > Spin N Win. Perform a simple skill test. Only those who pass this test are eligible for entry to the Contest. Example: 433+8 = 441. Tick I agree to the terms and conditions and click Let me Play. If you are lucky, you will see what yo have won. Eligibility: Spin N Win Program (the “Spin N Win Program”, “Spin N Win”, or the “Contest”) is open only to those who (i) clear the skill test on the Spin N Win page and follow the rules of entry (in the manner specified in point 3 below), (ii) are 18 years or above on the date of such sign-up/entry , (iii) are legal residents of the Republic of India, provided that this Contest is not available in any States/territories in India where prohibited by applicable law; and (iv) are not employees of Accelyst Solutions Pvt Ltd, the owner and operator of the website by the name and style of www.Freecharge.in and Freecharge Android App (“Accelyst”, the “Sponsor” or “Freecharge”), their respective affiliates, subsidiaries, advertising and promotion agencies, suppliers and their immediate family members and/or those living in the same household of each (“you” or the “participant”). The Spin N Win Program is subject to all applicable federal, state and local laws and regulations of India and void where prohibited by law. Agreement to Rules: By participating, you agree to be fully and unconditionally bound by these rules governing your participation in the Contest (the “Rules”), and you represent and warrant that you meet the eligibility requirements set forth herein. In addition, you agree to accept the decisions of the Sponsor, as final and binding as it relates to the Contest and no claims shall be entertained in this regard. Spin N Win Program Period: Entries to participate in the Contest will be accepted online starting on or about 00:00:01 a.m. (IST) on 18th April, 2016 and ending 11:59:59 pm (IST) on 29th May, 2016 (“Offer Period”). Other Promotions : Please note that we may be running similar contests at the same time as this Contest. By entering this Contest, you will not be eligible to receive any Prize awarded in any other contest unless you enter each contest separately.